An MP3 recorder software helps you with recording playback audio which you hear on your speakers or any other audio output device. In other words, any audio that gets processed by the soundcard of your computer can be recorded by an MP3 recorder software. This way you can record pretty much any audio playing on your computer. So, if you want to record a podcast or a live stream you can do it with MP3 recorder software. In this article, we’ll introduce to you the Best MP3 Recorder Software and how to use it to capture any audio into MP3. Free Sound Recorder is a utility that you can rely on in the hour of need. You can record your music or important calls using this best MP3 recorder software. You can also record your lectures and other stuff like podcasts so that you can listen to them later during your leisure time. The usability is the main reason for Free Sound Recorder to be a preferable choice over other similar software. Whether you are a computer geek or a layman as far as MP3 recording is concerned whenever you are looking for a software to cater your recording needs you should focus on below-mentioned points to choose the best fit. It should have a simple interface so it’s easy to use. It should provide all the necessary features while keeping everything simple. In other words, it means that it should have a built-in player and some basic options for customizing an MP3 recording session according to your specific requirements. A good MP3 recorder allows you to cut, crop, copy, paste as well as add special effects to an MP3 audio file while recording it. It should let you choose the file format of the output file so that you may use the recorded file instantly instead of looking for a format converter to make it appropriate for your media player. It should be free so that you don’t have to worry about the money that you have invested in it once you don’t need any MP3 recording anymore. While the software should be a freeware – it should also not be limited to MP3 recording. It should also let you record other sounds produced by your PC as well as let you record the conversations carried out over the Skype, Facebook or any other software installed on the computer for communication purposes. 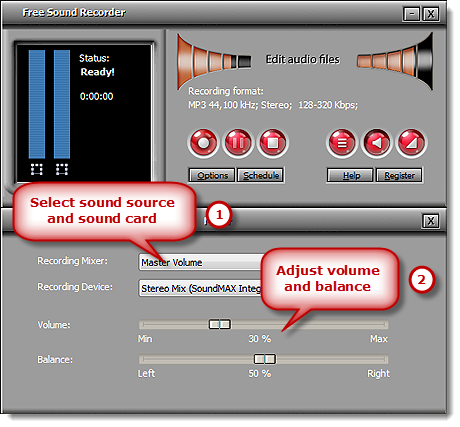 Free Sound Recorder lets you customize the audio recording and allows you to hear the recently recorded audios with the help of its built-in media player. It allows you to adjust the Volume and Balance while recording a sound. In this way you can handle the recording of a loud or a feeble sound without losing clarity. Often when you are listening to music on YouTube and find something you really like but when you try to find an MP3 version of that you notice that don’t have much luck with that. Free Sound Recorder can come forth to help you here by providing its services as an MP3 recorder. 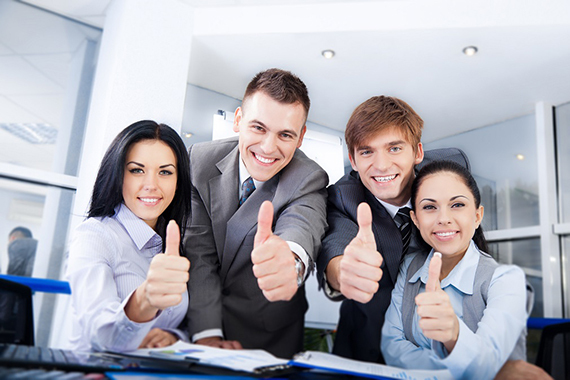 Free Sound Recorder is a superb tool that offers great value and usability. 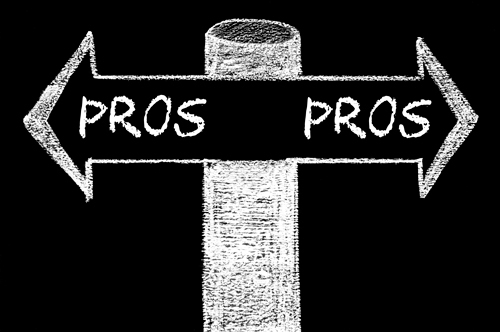 These two features make it into a very attractive option for newbies. 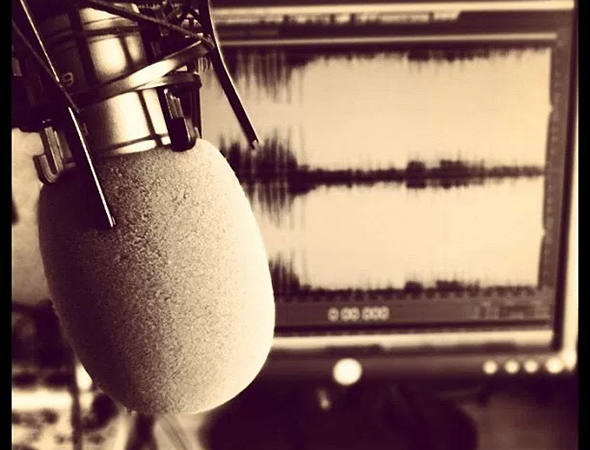 Apart from above-mentioned pros that make it the best choice for MP3 recording purposes, it is a “one in all” kind of solution for a lot of day-to-day audio recording and editing tasks. Free Sound Recorder is a software that needs no doctorate to operate. It’s rather simple and pleasant to work with. This usability and ease of access make it a favorable choice for someone looking to record audio with no prior experience. The first step, obviously, is getting the software. So download and install Free Sound Recorder. Now that you have installed the software, launch it, and click the ‘show mixer window’ button. This will give you the option to select a sound source of your choice. The lists consist of entries like Video volume, Mic volume, Stereo mix, Line in, CD Audio etcetera. So, choose the recording device you want from the ‘Recording Device’ dropdown menu. Adjust the balance and volume to your preference. For the next step, click ‘Options’ button to access the ‘general settings’. 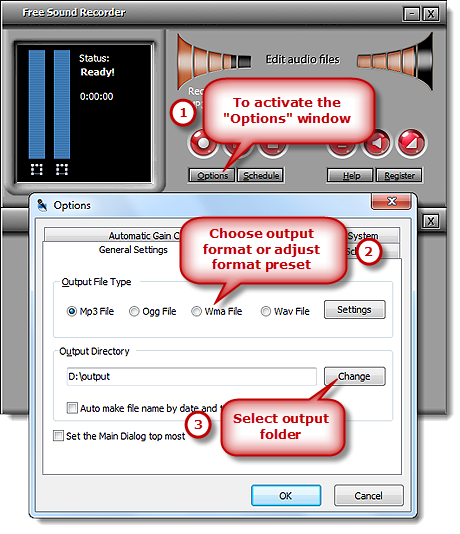 Here you can select the output format for your recordings. You can select between MP3, WAV, WMA and OGG. After selecting the output format, the next step is to select the output quality. You can choose amongst the presets given or you can fine tune them according to your requirements. To select the output directory click change to specify an output folder. The files can be named according to date and time too. The start recording button, as is apparent by its name will start the recording process and when you want to stop it just click the stop recording button. The resulting audio will be saved into the output folder automatically. It will have a detailed account of the file like its filename, time and date, location. You can also play the media with the help of the built-in media player. Please see the below-mentioned image for guidance. 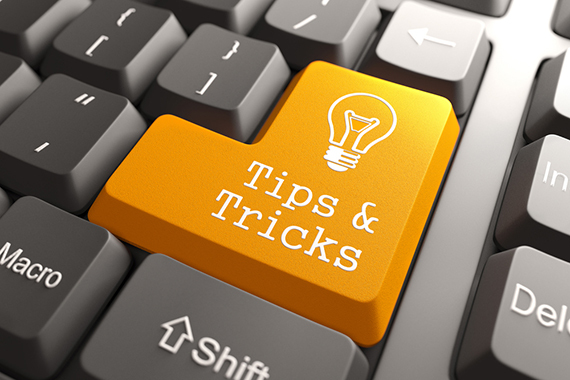 Either it is huge software or a small utility; there are always some tips that serve as a stitch in time. Here are my few cents that I am sharing with you guys to ensure an enjoyable relationship with Free Sound Recorder. Choose the best quality source file to ensure that you are feeding a healthy and balanced audio input to the MP3 recorder. Change the default output folder to a more easily accessible place to save yourself from locating it when you are in a hurry. 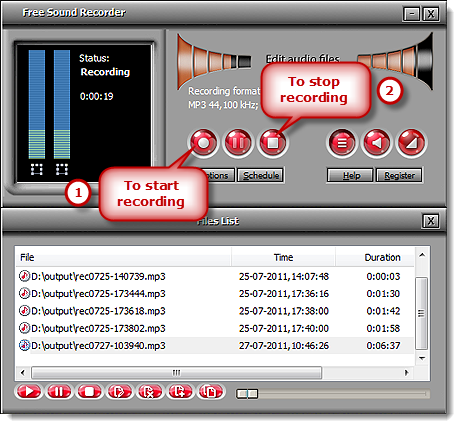 All in all Free Sound Recorder is a complete software for recording audios in MP3 format. It won’t be wrong to say that it’s the best available freeware that gives optimum performance because it hits all the marks of a good MP3 recorder.